Al-Sahaf: "The Americans, they always depend on a method what I call ... stupid, silly. All I ask is check yourself." 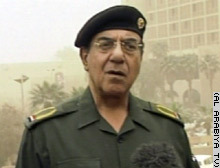 The Iraqi information minister says the center of Baghdad isn't breached. Coalition troops encircle the Iraqi capital, the U.S. military says. BAGHDAD, Iraq (CNN) -- In an apparent show of defiance, Iraq's Information Minister Mohammed Saeed al-Sahaf stood in the streets of Baghdad Monday morning amid a U.S. raid on the capital, issuing denials of coalition advances. "The soldiers of Saddam Hussein have given them a lesson they will never forget," he said. "We will in fact encourage them to commit more suicides. We have given them death and poison. "These mercenaries, I swear by God, those who are still in Washington, they have sent their troops to be burned." He said the battle had been very fierce and was still ongoing. Iraqi civilians are rallying to defend Baghdad. "Be sure that Baghdad is safe and secure and our great people are strong," Sahaf added. He denied certain buildings, such as the al Rashid hotel, were under coalition control. He chided journalists, blaming Arab network Al Jazeera for "marketing for America."